Front row, from left: Paris Nguyen, Brooklyn Pilon. Back row: Bryan Phan, Taylor Taite, Nate Stilinovich. Not pictured: Taylor White. Two standout players were honored from the Rams softball team. Freshman infielder Paris Nguyen is hitting .350 with 19 RBIs and has displayed excellent defense. Freshman outfielder Brooklyn Pilon is hitting .333 and has also been strong defensively. Nate Stilinovich, a junior, has contributed valuable offense and defense as a pitcher and outfielder for the Rams baseball team. Bryan Phan set a school record in the 400 meters and ran a leg on the school record-setting 4x400 relay team for the boys track team. He will compete in both events at the CIF finals. Taylor Taite of the girls track team advanced to the CIF finals in the 1600 meters. Taylor White was brought up to the varsity girls lacrosse team and contributed to a big win over Vista Murrieta. 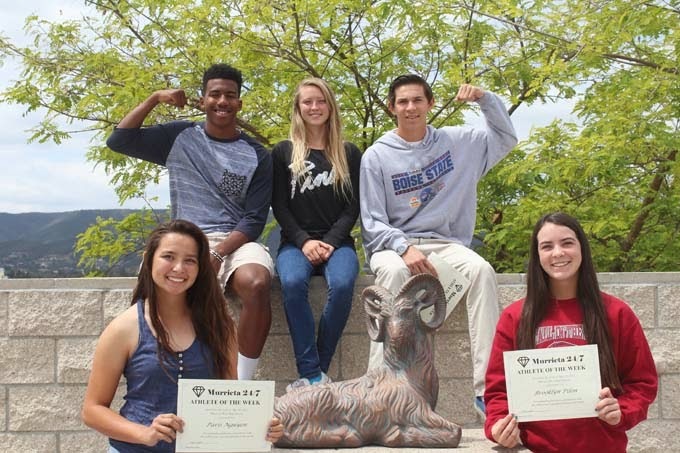 These athletes will be eligible for selection as Murrieta Mesa High School's Athletes of the Month, which will be announced the first week of June. Anyone wishing to order a glossy print of this article with photo may do so by emailing murrieta247info@gmail.com.